Hemin Hawrami, a senior assistant to Kurdish President Masoud Barzani has quoted the Peshmerga statement on the recent Iraqi troops' advance in the Kirkuk region. The statement was made after they managed to gain control over the K-1 military base, Kirkuk airport, two oil fields and over Kirkuk's irrigation system. Peshmerga has condemned the recent Iraqi armed forces advance into Kirkuk, calling it a declaration of war. They also accused a faction in the Patriotic Union of Kurdistan of helping Iraqi military campaign. Jalal Talabani, the leader of the union, has died earlier this month. The Peshmerga is not coordinating its actions with the Iraqi forces, Kurdistan's Peshmerga Ministry's Chief of Staff Lt. Gen. Jabar Yawar told Sputnik on October 16. "There is no coordination between the Peshmerga and the Iraqi government armed forces in Kirkuk province. There are no channels for such coordination due to the disputes between Iraqi Kurdistan and Baghdad over Kirkuk," Yawar said. In his statement, Abadi ordered the Iraqi forces to cooperate with Peshmerga militia and avoid confrontations. Earlier in the day, he said that Baghdad had urged Peshmerga to "carry on its duties under federal leadership." The Kurdish authorities said that the Peshmerga was permitted to stage counter-attacks, but not begin clashes. 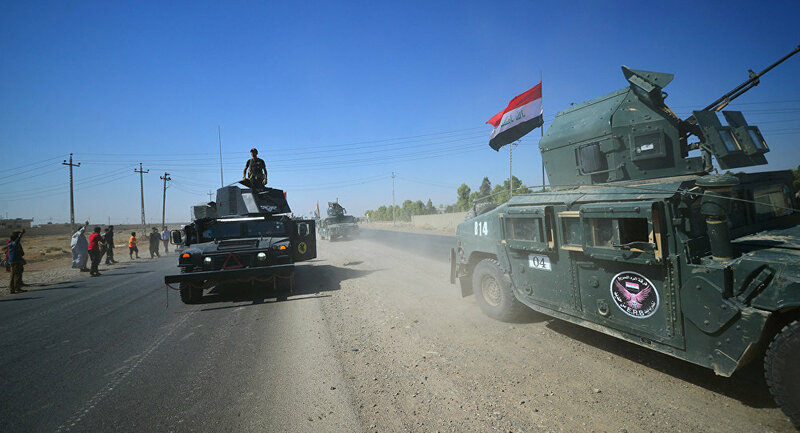 Earlier in the day, Iraqi troops have entered the city of al Tuz Khurmato southeast of the contested city of Kirkuk. According to al-Ikhbariya television channel, the servicemen have gained control over the security situation in the region. 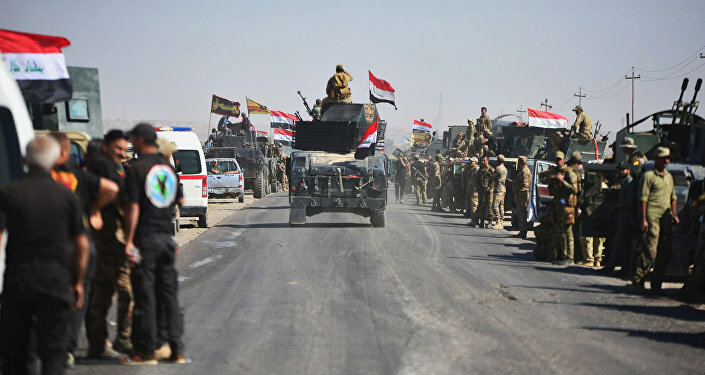 The representative of the United Nations High Commissioner for Human Rights in Iraq, Ali al Bayati, told Sputnik that the recent clashes in the area of the city of al Tuz Khurmato in the north of the province of Salah ed-Dean have already killed two civilians and wounded four, leaving the others trapped without internet and electricity because of blocked roads. On Sunday, October 15 Hemin Hawrami, a senior assistant to Kurdish President Masoud Barzani, said the Peshmerga had destroyed four Humvees that were trying to enter the province of Kirkuk from the south. Later in that day, Iraqi Prime Minister Haider Abadi ordered the country's army and police to secure bases and federal installations in Kirkuk, but avoid confrontations with the Kurdish forces. The oil-rich Iraqi province of Kirkuk participated in September's Kurdish independence referendum, despite not being part of Iraqi Kurdistan.